No Dryer For Over 2 Years. Yes, I do wash my clothes. 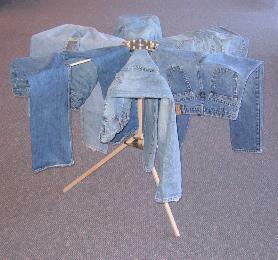 I dry everything on a clothes drying rack. I find this is the most efficient way for my family to dry our laundry. If it is cold or rainy I can still do laundry. If it is late items can dry overnight. If it is sunny the rack can go out-side and take advantage of that wonderful disinfecting, brightening sun. Wow, 2 years without a dryer. I bet you see a very nicely reduced hydro bill. There was a time when I tried to follow someone I knew who hung up all laundry in the basement to take advantage of the furnace heat over the winter months. Even with a much smaller family than they had, drying jeans and certain other heavier items seemed to take forever, and of course they were stiff as a board and didn't feel very comfortable to wear. Five minutes in the dryer fixed that, and was certainly more cost efficient than 60 minutes. I found this extremely time-consuming too to put up and take down while working outside the home. It helps to find the perfect schedule I think to allow for extra drying time, allow for items you don't need immediately, and try to do this on the days you aren't working. It was a little difficult to walk around in the basement as well, with clotheslines strung all over, but that was a minor inconvenience in view of what I was accomplishing by not using the dryer. As we know, the dryer is notorious for running up your energy bills. It was all worth it to do this as much as possible in the winter to save on using the electricity. And, it doesn't take much effort to slip blouses onto a hanger and hang them that way either. A clothes drying rack outside in the summer months taking advantage of the free sunshine and warm air makes perfect common-sense to me.